Inspired by her son and driven by a lifelong love of learning, Rosalind Miller, a Customer Assistance Representative at Philadelphia (PHL), enrolled as a freshman at Spelman College in Atlanta at an age when many are thinking of retirement. It was the first step in a nine-year journey, traversing more than a million miles, that challenged her to realize her full potential and pursue her passion for helping those in need. A native of Philadelphia, Rosalind never thought her path would lead her to work in aviation, having spent the first two decades of her career as a medical transcriptionist. In fact, it was an opportunity to work for Piedmont Healthcare that brought her to Atlanta, where her son was pursuing an undergraduate degree at Clark Atlanta University. And it was in Atlanta, “surrounded by such a rich culture — so many academic institutions and a supportive son,” she said, where she was inspired to earn her bachelor’s degree. That aspiration led her to enrol in Spelman College, the country’s oldest private historically black liberal arts college for women, as a Pauline E. Drake Scholar in the spring semester of 2009 at the age of 51. But just a semester into her education, Piedmont Healthcare began downsizing and financial challenges forced Rosalind to move home to Philadelphia. Undeterred, Rosalind landed a part-time job as a gate agent with Piedmont Airlines at PHL, an opportunity that provided both a flexible schedule and flight benefits that made it possible to travel between work and school. 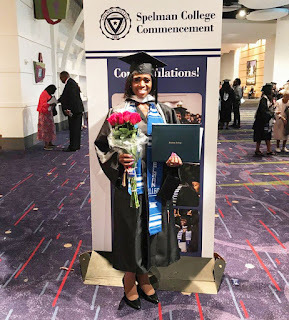 She admits that she could have taken an easier path and transferred to a local university, but she knew the learning environment afforded by Spelman would be more fulfilling. As a result, Rosalind spent the subsequent years commuting three times a week between school in Atlanta and work at PHL. Each semester, Rosalind took two courses, which she scheduled around work. On a typical day, she covered the early morning shift, giving her 30 minutes to clock out and make the flight to Atlanta for her afternoon classes. “At work, I’d carry my textbooks with me so I could spend my breaks catching up on assignments,” she recalled. Rosalind’s commutes weren’t always easy, though, having spent many nights in the airport after missing the last flight of the night home. Nevertheless, she credits her professors, classmates and leaders at American with providing the encouragement, flexibility and support she needed to accomplish her dream. Since obtaining her degree, Rosalind has found a renewed passion to assist our customers and the community, particularly disadvantaged women. Motivated by her lifelong desire to learn, she continues to augment her work as a member of the Professional Women in Aviation Employee Business Resource Group, as an intern for the Women’s’ Law Project, which was founded to advance equality and justice, and through continuing education courses at a local community college. “Rosalind exemplifies the values we as an American family aspire toward,” said Jim Moses, Vice President of Hub Operations at PHL. “Her journey demonstrates what is possible when dedication and resolve are supported by a community that encourages you to realize your potential and achieve your dreams.” -- -- -- .